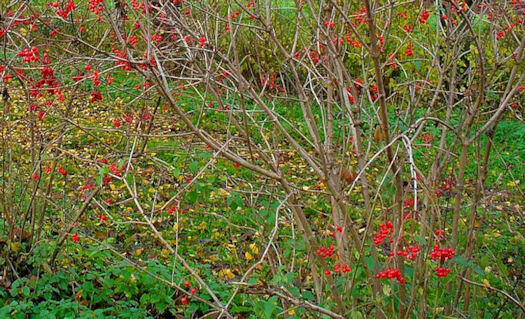 Hardwood cuttings of deciduous shrubs can be taken throughout the dormant season but the best time to do this is just after the leaves have fallen, or just before the new buds break. Unlike other types of cuttings, hardwood cuttings are usually left outdoors to root and require very little care during the rooting period because there is no need to maintain high humidity around the cuttings. For lots of cuttings, you can dig a trench in a sheltered spot, place sand at the bottom of your trench and place your cuttings in that. However, most of us only want a few plants of each species so we are going to simply place our cuttings in pots. 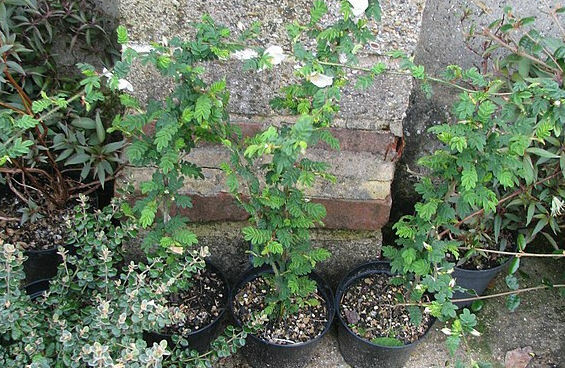 You can try hardwood cuttings for any deciduous shrub, including climbers, as well as quite a few evergreens. There are lists of plants 'suitable' for hardwood cuttings but, in those long, boring days of winter, my advice would be try any woody plant you fancy since there's not a lot else to do and the costs and maintenance are minimal. The only thing you must do is to make sure the plant you choose is healthy. Your cuttings will be clones of the parent plant and will inherit all its characteristics, including any weaknesses. Early morning is the best time to take cuttings as the plant will be nice and turgid (full of moisture). The best material for hardwood cuttings is youngish wood which has had a full season to ripen. The cutting you take should be around 15 - 20cm long and about the width of a pencil. You should make the cut just above a node on the parent plant. 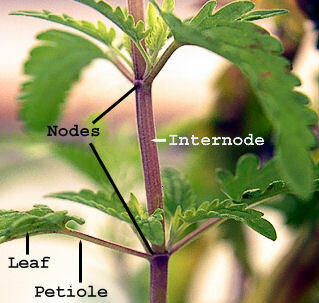 Nodes are the little bumps on the stem where a leaf or branch was or is still attached. 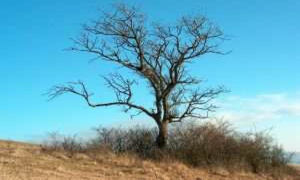 They are the sites of cells which are capable of dividing and developing new growth. Internodes - the spaces in between nodes - are not able to create new side shoots or flower buds and, if you leave them on the parent plant, they could die back and allow disease to enter. Later you will trim your cutting to just below a node but, for now, we need to ensure we care for the parent plant first. When you cut from the parent, make it a straight cut and then go immediately to the top of the cutting and remove the tip around a couple of nodes down using a sloping cut. Straight and sloping cuts are made in this way only so you know which way up to place the cutting in the pot. Make sure your secateurs are nice and sharp to avoid crushing the cells and damaging your cutting and, at all times, that you make a good, clean cut without damaging the stem on the parent plant. Aim to take more than five cuttings from each plant species you choose because they won't all be successful. Fill a pot that is around 20cm deep with the medium of your choice and gently compress it. Prepare your cuttings by making another clean, straight cut just below a node at the bottom of the cutting. At this point you can dip the cutting in hormone rooting powder but I don't usually bother. In theory, hormone rooting powders contain synthesised plant growth hormones which should increase the success of your cuttings but, if you don't have any to hand, it's not a big deal. With a pencil, your finger, or a special tool called a dibber, make a hole deep enough to take two-thirds of the cutting before gently placing the cutting in the hole and firming around it. It's really important to create this hole first and don't just shove the cutting in to avoid damaging the cells at the nodes. Continue making holes around the edge of the pot, leaving around 10cm between cuttings if you can. Place your pots of cuttings in a sheltered spot outdoors and leave them for a good few months, preferably until the following autumn. In summer, make sure the cuttings are well watered until you are sure a good amount of roots have formed. After that, you can transfer them into individual pots and allow them to grow on for another year or two until they are big enough to plant into their permanent spaces. Taking hardwood cuttings is extremely easy - the only difficult part is the amount of time you have to wait until you have a fairly substantial plant but, hey, what else is there to do in winter?